I’ve been lucky enough to cover some pretty crazy automotive-related stuff in my time, but nothing, and I mean nothing, could have prepared me for the awesomeness that unfolded on an autumn day back in November. 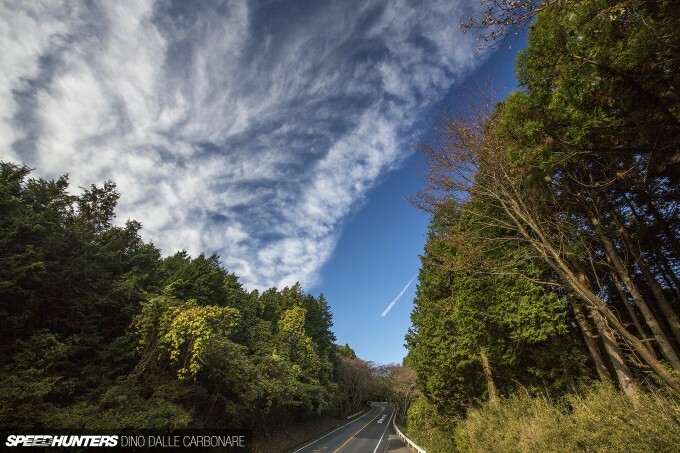 I have been driving the Hakone Turnpike for so many years that I’ve probably taken well over 100 cars up and down it. 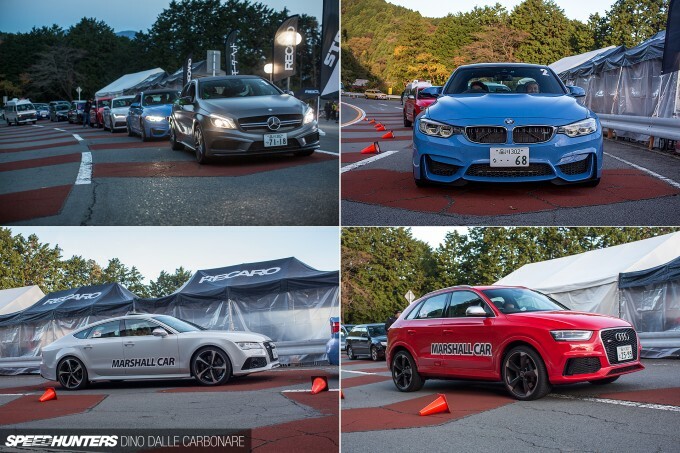 For Japanese car magazines it’s been a road course of sorts ever since it opened, and is the place to go if you want to put your car and driving skills to the ultimate test. It’s close enough to Tokyo for a quick afternoon expedition and since it’s a privately owned toll road, traffic is pretty much non-existent most of the time. On top of that, its surface is more like Fuji Speedway than a normal road. And then there’s the layout. I’ve always called it the mini-Nordschleife as it manages to throw all types of corners at you, and like any proper mountain pass it has to be driven both up and down to be thoroughly enjoyed. Every time I’ve driven this road I’ve thought to myself how epic it would be to run a hill climb here. They actually held them 30 or 40 years ago, but things have changed a lot since then. So to think that little ‘what if?’ dream of mine actually materialised into the Motorhead Hill Climb still blows my mind. If you haven’t seen the short film, do yourself a favour and press play below right now. If it was any other country, this event would have surely happened a long time ago. But this is Japan. It might not be obvious to the casual visitor who pops over for a quick holiday, but this is a country that’s regulated to the hilt. If it’s fun, the government will probably tax it, control it, and then use a fax machine to send out a set of rules and regulations for everyone to follow. If it’s a lot of fun, it’ll just be banned – like dancing in night clubs. I kid you not. So for this event to have happened, well… everyone is still very surprised that it actually did! The latest issue of Motorhead – with its 40-page feature highlighting every minute of the hill climb – has been on the shelves since Christmas Day, and as usual it’s a really nice read. But seeing as though not everyone can get hold of it easily, I thought I’d dedicate a post to the truly unforgettable day. The planning involved in making this event a reality goes all the way back to the beginning of last year when the team at Motorhead set the wheels in motion. Fast forward 11 months, and here we were – over 100 people all told, including media, officials, drivers and teams. The 5.00am start was painful, but it was also necessary as everyone needed to be briefed on what to do, when to do it, and where not to stand. Safety was the biggest concern, and the event needed to go off without a hitch to have any chance of being able to happen again in the future. 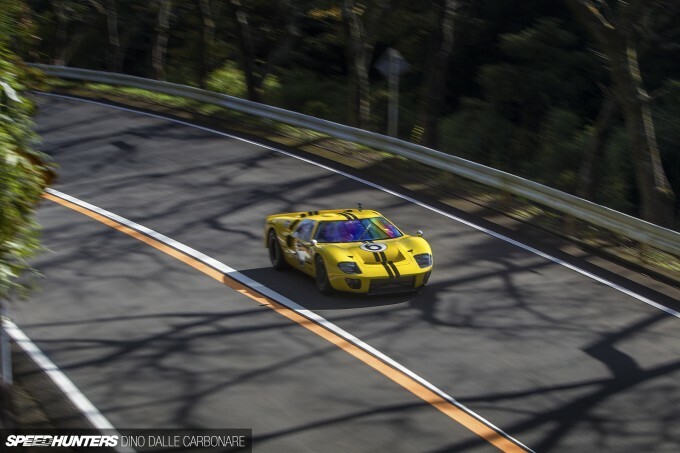 The idea was a simple one: four cars, four drivers and a specially-selected 7.5km long section of the Hakone Turnpike pass. Each car would get a few warm up runs before being allowed to attack the corners a total of four times – each time followed by its own pace car and escorted back to the pit area located in a parking area at the road’s base. While the event idea was cool in itself, the cars invited to participate had to be interesting too, and one of the first teams to sign up with their street-tuned GT-R were the guys at HKS. Their pilot – Nobuteru ‘Nob’ Taniguchi, a long-time driver for HKS and the man tasked with extracting the best possible time out of the 600hp-plus R35 on the day. 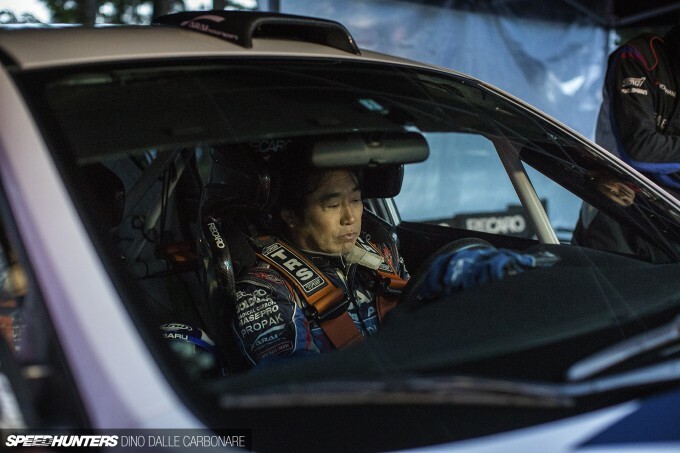 Next up was professional rally driver Toshio Arai. 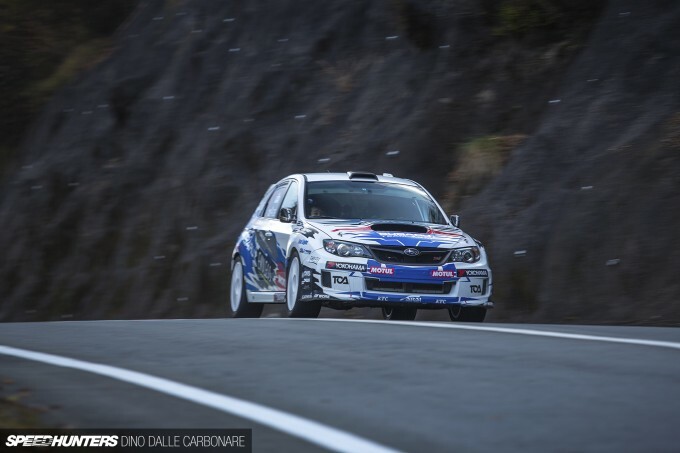 He entered the event with his Group N Subaru Impreza STI Spec C, which was setup for tarmac and sporting a ton of chassis and suspension upgrades. The engine, however, remained pretty stock, with an ECU fiddle and a free-flowing exhaust increasing total output to 300PS. 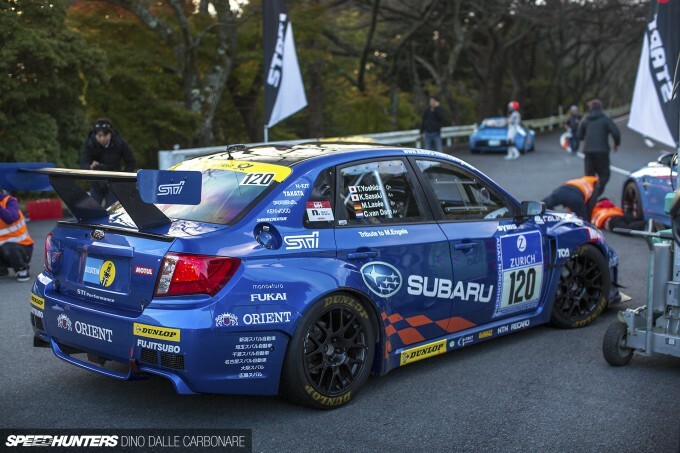 Next up was another Subaru Impreza, or more specifically the car that won its class at the 2013 Nürburgring 24 Hour. How appropriate! The man behind the wheel? That would be STI’s General Director, Eiji Tatsumi. He’s a rather handy driver, and for the last two decades the man responsible for ensuring that all STI-badged cars have the appropriate characteristics of a proper performance machine. This Impreza is pretty much a fully-fledged racecar, but due to regulations its tuned EJ20 breathes through a 38mm restrictor. Therefore power is capped off at 340PS, but it’s truly setup and built for these kind of trials. The team came out with Dunlop as part of the project. 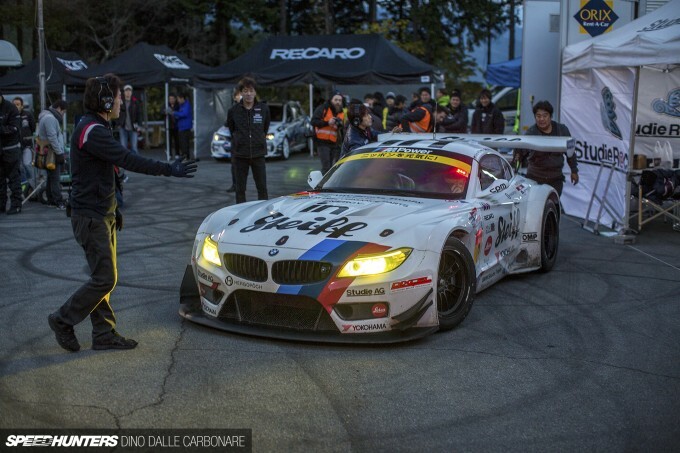 Car number four – and the one that had everyone excited – was the Studie Z4 GT3 from the ranks of Super GT. 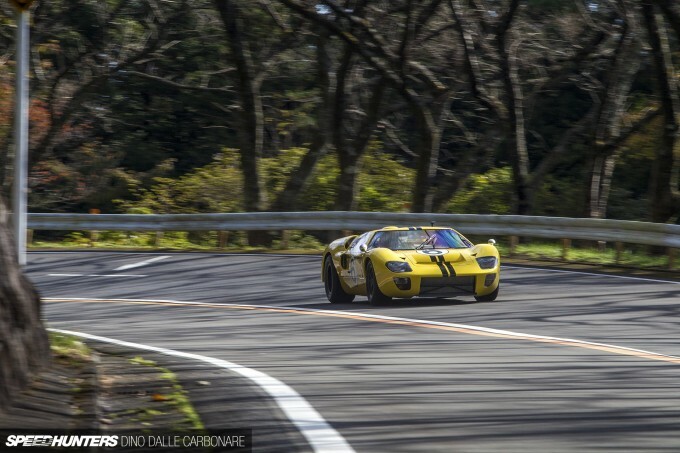 A few days prior this same car was being raced in the GT300 class at the Motegi round of the championship, but on this particular day it was ready to be unleashed on a mountain road – albeit set up with a higher ride height than usual. 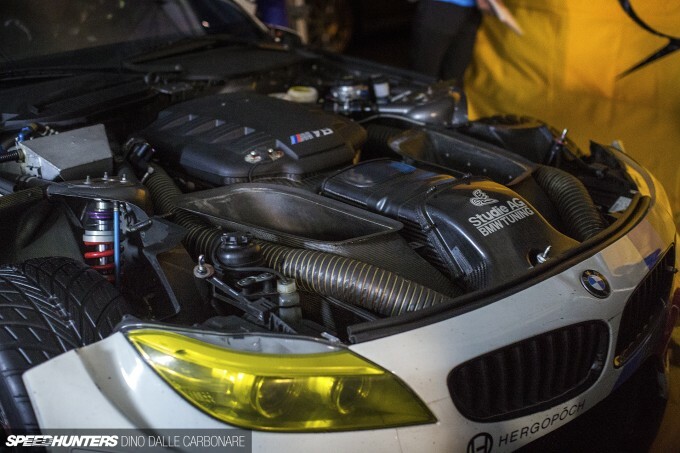 The Z4 is powered by a screaming 4.4L V8 that churns out 535PS when totally de-restricted; the engine sitting way back in the chassis for optimal weight distribution. Due to Super GT GT300 regulations the motor breathes through a restrictor too, so power is rated at 470PS. 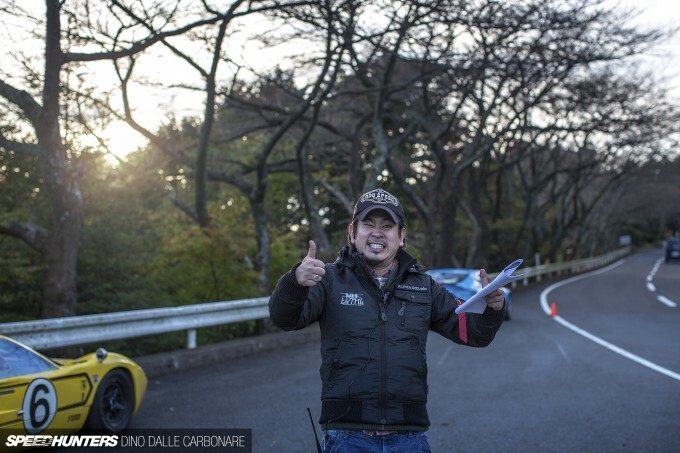 Piloting the car was Seiji Ara who has been with Studie for years. Winning Le Mans in 2004 with Audi and being a regular Best Motoring presenter, Ara is one of the most highly-respected Japanese drivers of the modern day. And given that he had the car with the most potential to win the Motorhead Hill Climb, all eyes were on him. 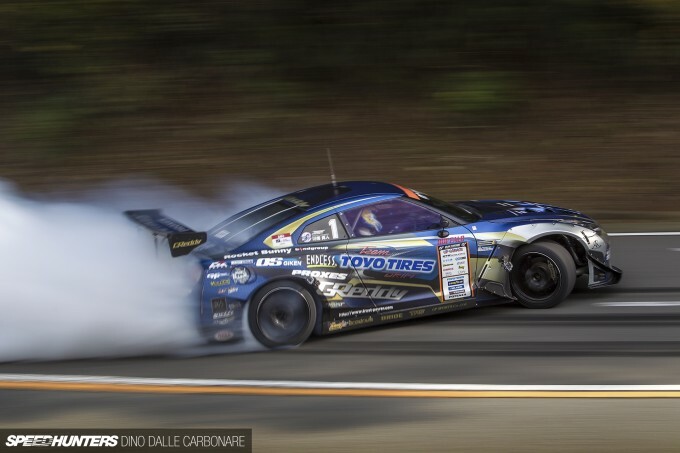 The anomalie in the selection of cars was this – GReddy’s Rocket Bunny kitted GT-R, as driven in the D1 Grand Prix series last year by Masato Kawabata. Why was it here? Well, on top of the time attack session, Motorhead thought it would be cool to throw a drift car into the mix for pure entertainment purposes. So after persuading the owners of the Turnpike that not too many black marks would be left behind (yeah right! 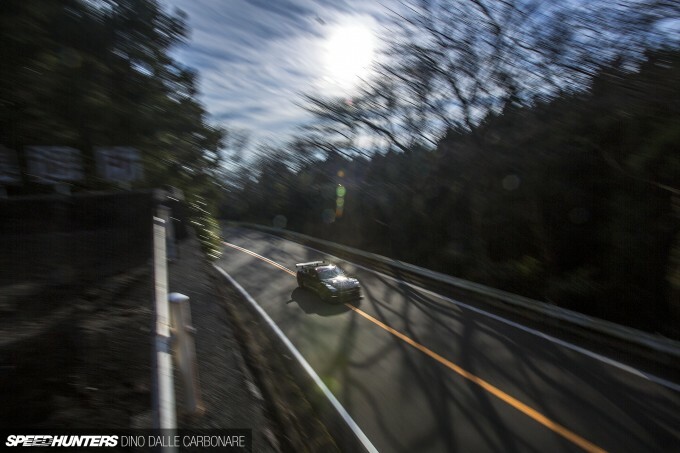 ), they asked Kawabata if he was keen on pitching the R35 sideways over a bridge at 200km/h. Of course he was! This whole event was the brainchild of this guy, Ko-hey Takada. 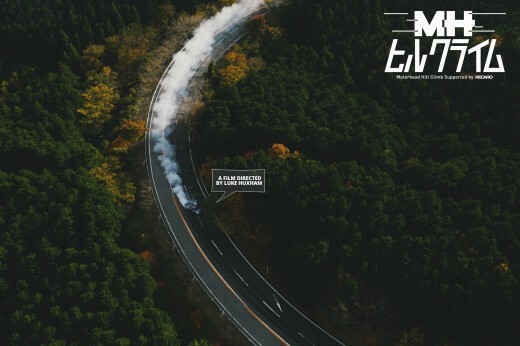 In a few short years he has managed to reinvent automotive print media in Japan, applying a winning formula of high quality photography, design and paper stock, coupled with captivating stories. He’s well on his way to making Motorhead a household name and had the right people on board for this crazy idea. Oh, and then there was this car. With the event being so unique, Motorhead thought that a classic racecar would bring a touch of class to the proceedings. This is no replica by the way – this is a real-deal 1964 GT40 MkII brought out of the massive M’s Vantec collection, which if you remember also includes this interesting car. I really fell for this 50-year-old beauty. 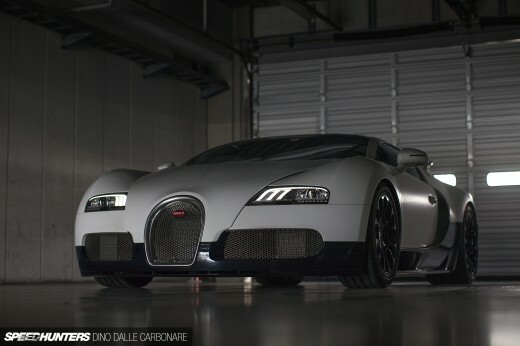 It stood just a metre tall, weighing in at roughly 1,000kg with a screaming 7.0L V8 strapped to its back. Just look at it and tell me what’s not to love?! As soon as first light broke the pits kicked into action; the sounds of powerful engines on their high, cold-start idles disturbing the peace and serenity of the tranquil mountains. After preliminary checks the cars manoeuvred into the cramped pit area and slowly lined up as their time to shoot up the Turnpike rolled around. 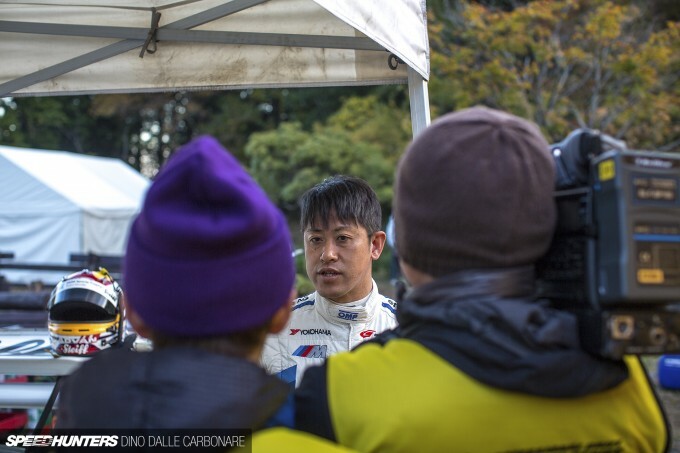 Taniguchi was itching to get going and arrived at the start line first. 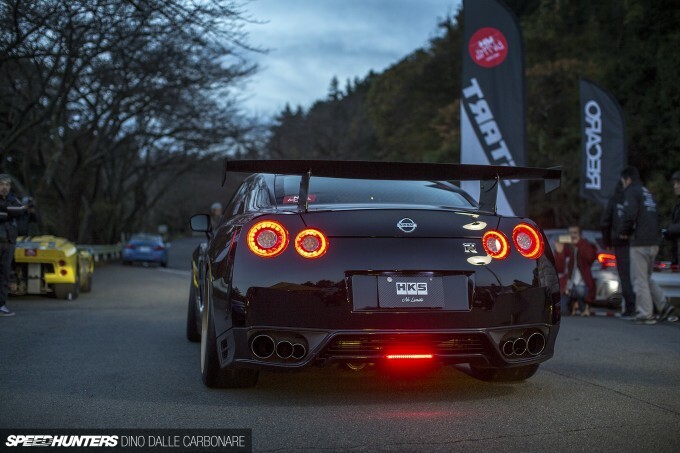 This GT-R is fitted with HKS’s GT600 kit with power boosted to the figure its name suggests. It’s the most popular kit that HKS sells to R35 customers, so the event was a great way to show what this upgrade package is capable of with one of the best drivers in the world doing the steering! Let’s not forget where Taniguchi originally honed his skills either – on touge roads not too dissimilar from this one, perhaps only tighter and slightly slower. 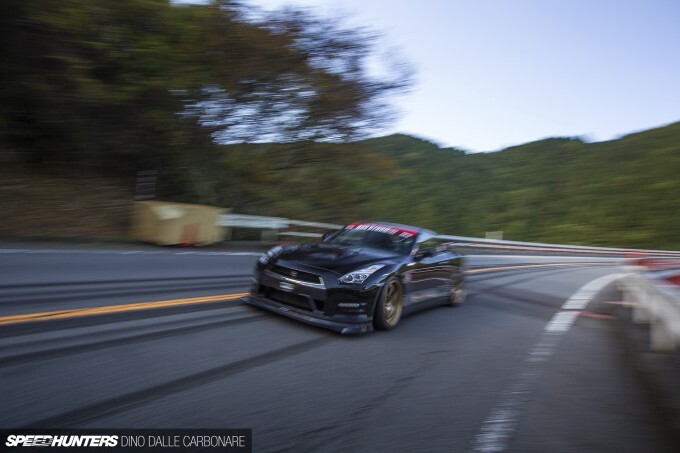 The GT-R catapulted away without any fuss, the gearbox upping cogs at a silly pace as the car piled on speed. After the Nürburgring STI, Arai was next in his Spec C – the barely-silenced boxer-powered machine nowhere near as powerful as the cars that had gone before it, but so well setup it probably wouldn’t need to brake much through the corners ahead. There were a good 10 or so minutes of silence and then gradually a buzz could be heard. All of the cars had patiently waited at the top of the pass, and once the course was clear returned in convoy back to the pits. I need to touch briefly on the pace cars, as Motorhead borrowed some of the hottest German metal on offer in order to have a chance at keeping up with the cars they were matched to. The A45 AMG followed the HKS R35 up the road and led the way when coming back down the pass. The BMW M3 (the very same car I had driven weeks prior) was teamed up with Ara-san, and since he was driving two cars on the day was on pace car duty for both the Studie Z4 and the M’s Vantec GT40. The 500PS Audi RS7 was looking after the STI Impreza while the 310PS RS Q3 barely kept up with Arai’s Subaru. Clearing the course before any racing went down was the job of this blue Aston Martin V8 Vantage, driven by Japanese veteran driver Tetsuya Tanaka. Once past the 12km marker – the end of the timed section – he would radio in to give the okay that there were no wild animals on the road or any other debris that would cause issues for the racecars. With all cars all warmed up, we headed up to the first shooting location. The air was crisp and cold to get the best performance out of the cars, and the sun was beginning to put some heat into the tarmac. It was a stunning day for a time attack hill climb session, that’s for sure. We got a quick confirmation from the radio that Taniguchi had began his attack, and then – like a flash – the black GT-R shot by. It was so unexpectedly quick that everyone shooting was left with an expression of pure shock. We all knew that these cars were going to pack some serious speed into their runs, but this was just crazy! A rethink on shooting was needed – I switched to my other camera with a wider lens and waited for the next passes. These were made at different times obviously, but for the sake of continuity in this post, I’ve bunched all the photos of each car together. 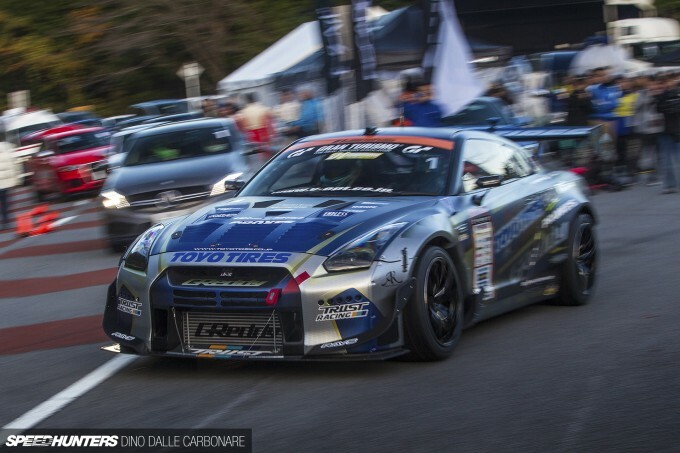 The GT600 R35 was running on HKS Hipermax dampers that were setup with some serious geometry to extract the most out of the street tyres the car was running on. The best time Nob could muster out of four runs on the 7.5km timed section was a 2’53″75, and the highest speed he hit on the fastest stretch was 220.42km/h. If you have ever driven on the Turnpike you will know that is ridiculously quick. Each car was outfitted with a Racelogic VBOX Sport Performance Meter to provide an accurate set of numbers. And here’s one more for you – 1.61G, the maximum lateral acceleration Nob achieved. 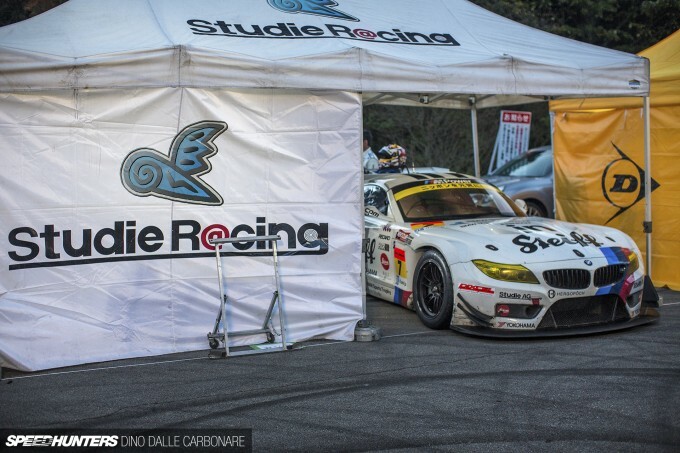 Next up, the Studie Z4. 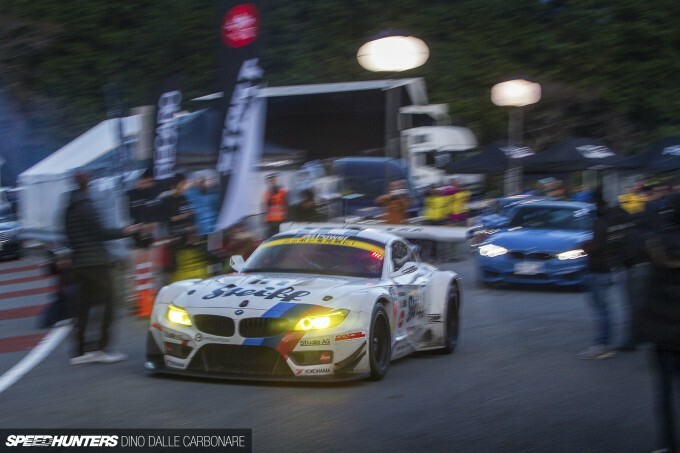 The black GT-R was fast but we all knew the GT300-spec BMW was on another level. However, Ara’s first pass in the morning was a 2’54″20, so it didn’t seem that quick compared to what Nob had achieved. The engine sound made it seem so much faster though! On its second pass, even by turn three where I was standing, the car was visibly carrying more speed. This time he went quicker by four seconds. I was at the top end of the course for the afternoon sessions, standing on the second to last open corner that leads into the final gradual right. The road really opens up here and the speeds were mind-numbingly quick. Standing by the side of the road behind the guardrail, barely a meter from the car, I felt the wall of sound resonate right through my ribcage. It was almost overwhelming, taking my breath away for a split second. 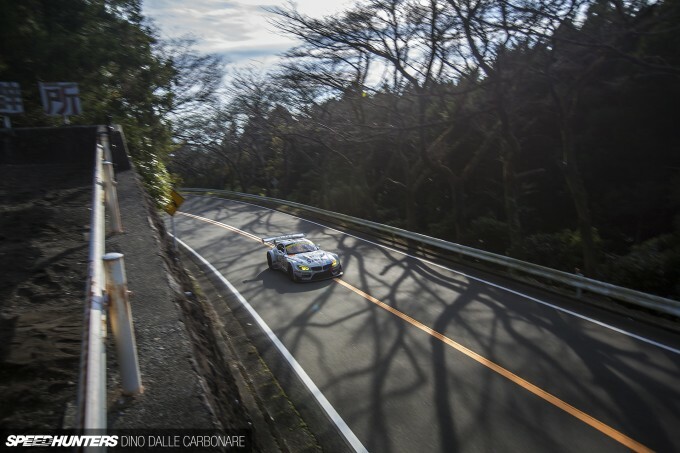 On his third pass, making full use of all the downforce the Z4 manages to develop, Ara managed a 2’47″10. Then his final run came up as the sun was almost setting. I don’t know what they did in the pits – perhaps cranking the rear spoiler as vertical as it goes, or maybe switching to a sticker compound of slick, but he dropped the time down to 2’41″35 – a whopping 13 seconds faster than his initial morning run! 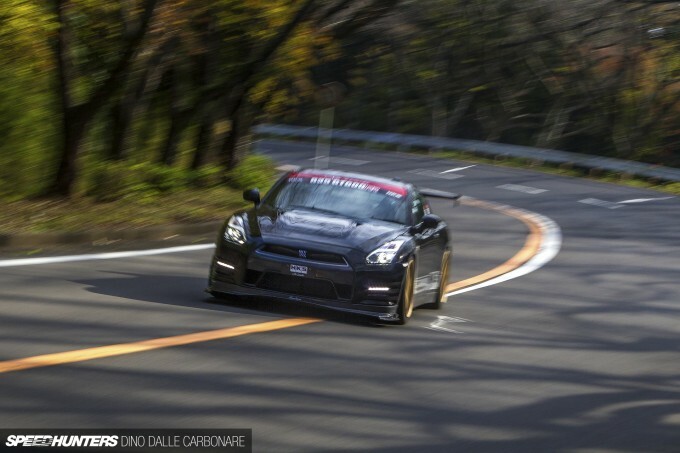 Strangely enough, his top speed was slower than that of the HKS GT-R at 216.62km/h, but the maximum lateral acceleration reading was 1.92G, hinting at where racecars find their increased pace over powerful road cars. Tatsumi-san was next in the STI Nürburgring Impreza. He was way down on power, grip and downforce compared to the first two cars, and his best time of 3’03″90 with a top speed of 190.53km/h was a refection of that. It put things into perspective, right? The maximum G achieved on the street-legal Dunlops was 1.50, which in my book only makes the HKS GT-R’s numbers all that more special. 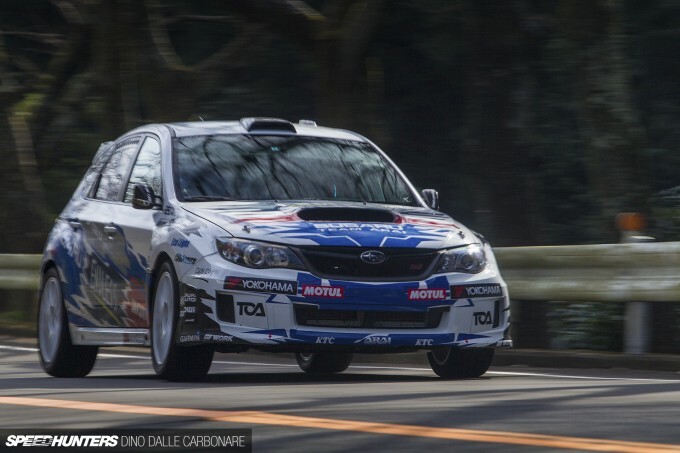 Japan’s premier rally driver was next. A 3’03″50 was the best time Arai could extract from the car that he built and setup himself. Despite a 40PS power deficit when compared to the Nürburgring STI, the Group N spec Impreza was a whisker faster. That’s pretty cool, don’t you think? 190.11km/h was the highest speed it hit and Arai managed to pull more lateral Gs on the Yokohama tyres with a 1.51 reading. Here he is returning slowly down the pass after his final run, the Audi RS Q3 pace car following right behind. This wider shot gives you a better perspective of what the Turnpike looks like from the top of the mountain it climbs up over. Ara-san was also called on to drive the GT40, partly because he’s pretty compact himself, and therefore able to fit into the tiny cockpit. 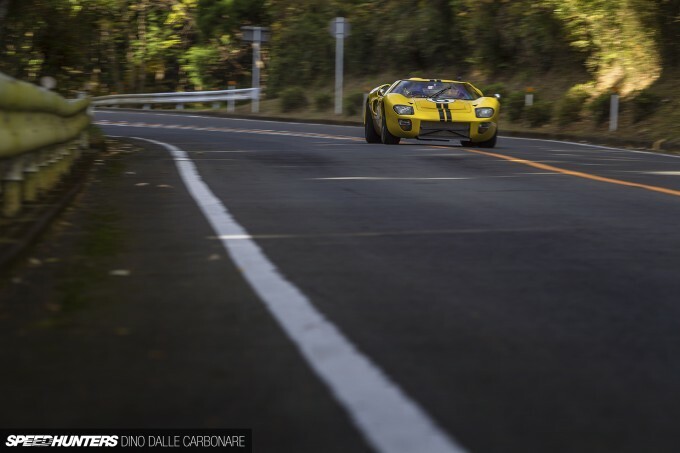 Considering the multimillion dollar value of this vintage racer – not to mention the fact that it was running on tyres that were probably older than most people reading this right now – we weren’t really expecting it to post any record-breaking times. However, it did set a baseline number that all classic cars entering this event in the future (if they happen) will be measured up against. That time is 3’48″50; Ara using the car’s extremely long gearing (it was set up for Le Mans after all) to wind 156.49km/h out of it. Then it was Kawabata’s turn. Before we proceed any further, I need to quickly state that this man is my new hero. 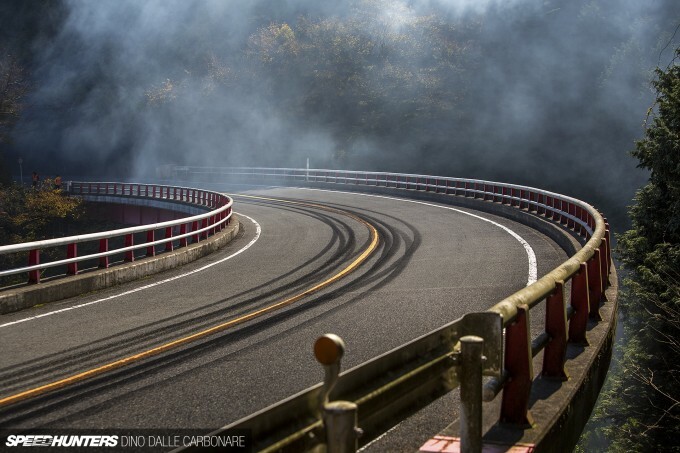 Sure, plenty of drifters have gone sideways on mountain roads, but seeing this guy do what he did with the 1000PS-plus GReddy R35, well, let’s just say I will never look at that corner on that red bridge the same way again. Kawabata’s drift actually started a little bit back before the bridge, allowing him to pack on as much speed as possible to initiate the corner in 5th gear. Yes, 5th gear! 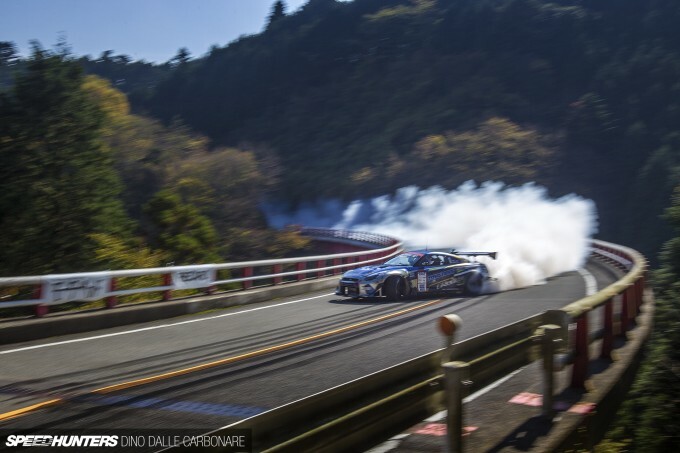 214.98km/h, burning up thick Toyo R1Rs sideways, on a bridge, 80 meters over a steep valley requires the biggest pair of testicles you could possibly imagine. The thing is, Kawabata didn’t even really stop drifting after the bridge where everyone was shooting and filming from. 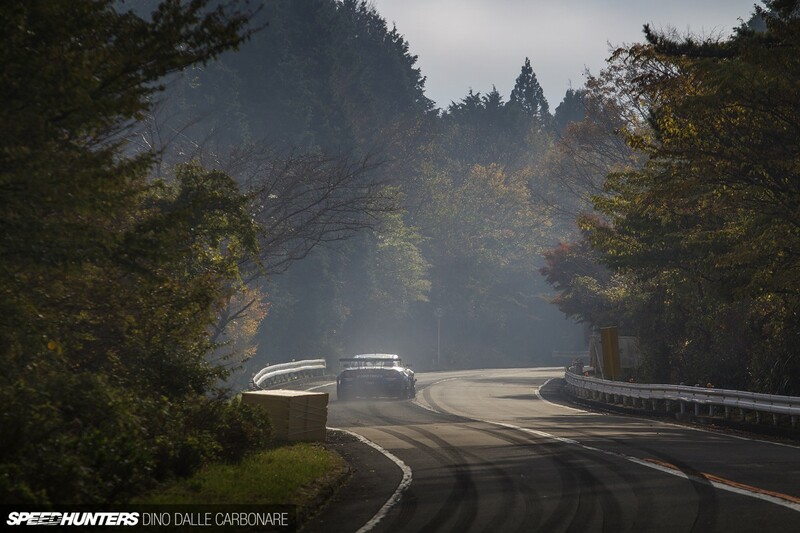 And going some more, right until the moment where the GT-R disappeared in a thick cloud of smoke. 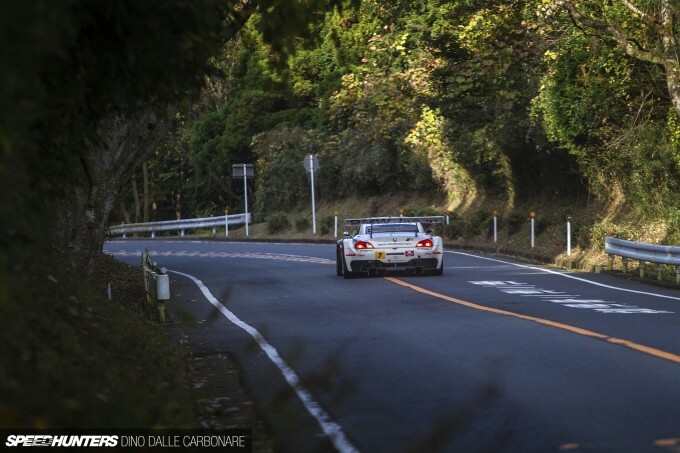 Seeing that he was there and the road was closed, the GReddy guys even had Kawabata go out for a grip run to see what the massively-powerful RWD R35 could manage. He only had one go, crossing the finish line in 3’16″96. 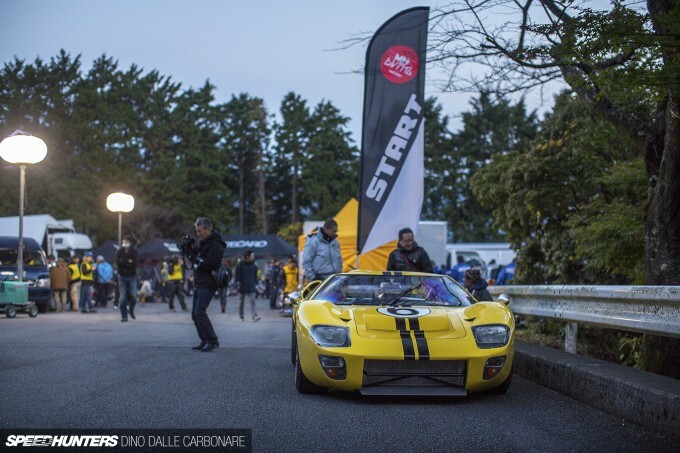 Yes, this was an event of monumental epicness – one that has taken Japan’s already cool and inimitable car culture and made a hell of a lot better, if that’s even possible. I take my hat off to Takada-san and his team, not to mention all those that participated and were involved. I’m so grateful that I was brought in to be a part of it. 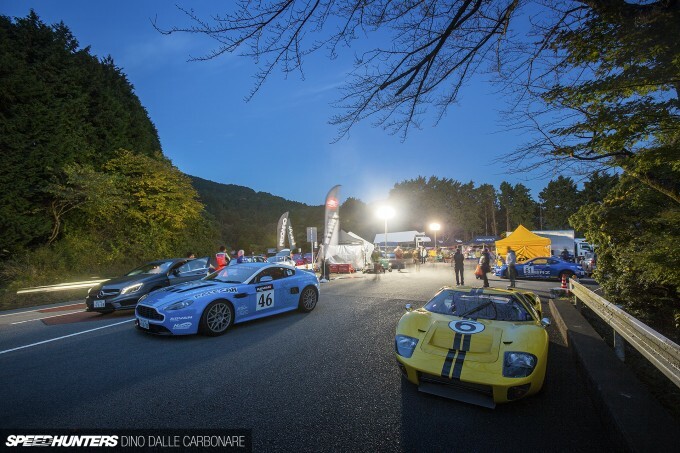 The Hakone Hill Climb must happen again. Every year henceforth. It just has to, because it can only get bigger and better if given the chance. 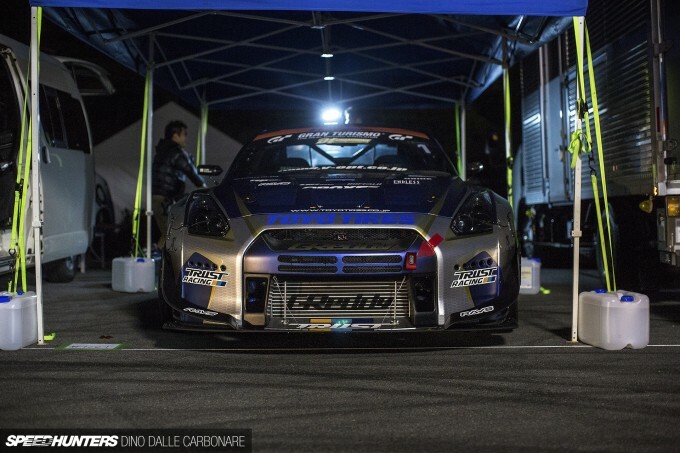 Update: For a closer look at Toyo’s R35 GT-R, check out the video above. Am I the only person who thinks the optical quality of pictures in this post were lacking? Some of the low ISO shots are excessively noisy (Nob GTR surprise), there's visible banding even in sunlit shots (Kawabata drift #1), and almost none of the pans are sharp. The last one pains me the most. 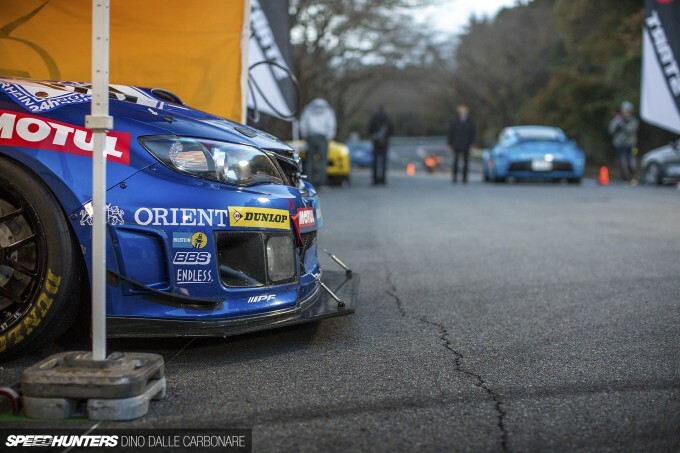 I mean, nice pictures otherwise, but it's not exactly the quality I expected from Speedhunters. @Anymouse I have to strongly disagree here as I think Dino has done an absolutely fantastic job with these images. Dino, I am so so jealous of you getting to attend this!!! "Then it was Kawabata’s turn." I feel like the written part of the article could have almost stopped right there. 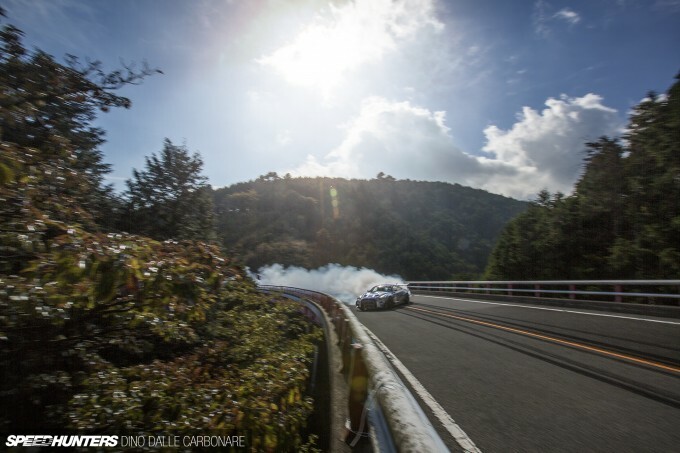 Glad it didn't, though, because... "214.98km/h, burning up thick Toyo R1Rs sideways, on a bridge, 80 meters over a steep valley requires the biggest pair of testicles you could possibly imagine" seems to sum it all up pretty well. I remember the first time I watched the film. Yeah, didn't really have much in the way of words for what I saw. Especially when Kawabata assaulted the turnpike. Glad you could cover and share this event, Mr. Carbonare. They should have a chat with the FIA about getting this event on the International Hill Climb Cup calender. Funny thing as I watched the video last week was I thought that this was a regular event, that I just haven't heard about before. I agree that it could become one of the great motorsport events with the right will. It sure looked spectacular on youtube, but must of been unreal in person. 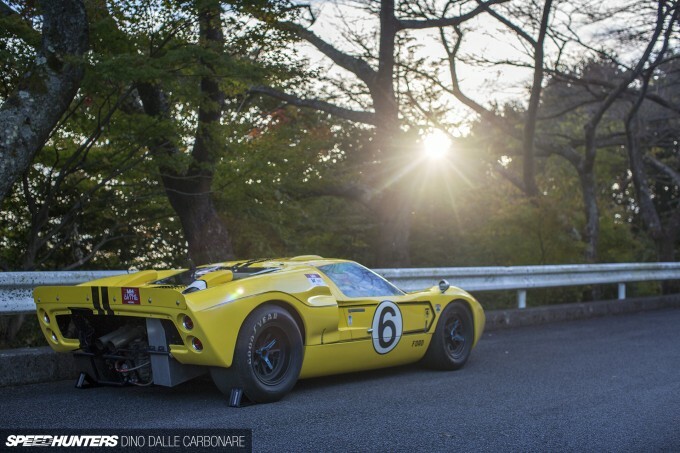 To whoever the person is that allowed the GT40 to actually be driven in this event... I would like to buy you a few beers. Jagdroach You are totally right, the guy is a star! 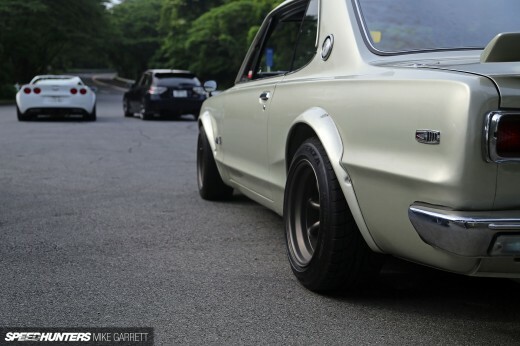 DecMcClure I don't agree, has to stay small-ish and stay Japan based when it comes to cars. Dino and SH as always leading the pack with automotive media. kawabata has been the best of the best of a while in my eyes. Ever since that reverse entry video from D1 surfaced around the same time SH got its start, hes been the one to watch. Dont get me wrong, Kuroi (RIP) along with say Nob and others can definitely drive like hell, but Kawabata is on a different level. One of the best written and most entertaining SH articles. Keep 'em coming! @Anymouse I could care less about the artsyness of the photos. Im here for cars. majik16106 Because FIA would regulate the event with silly restrictions. 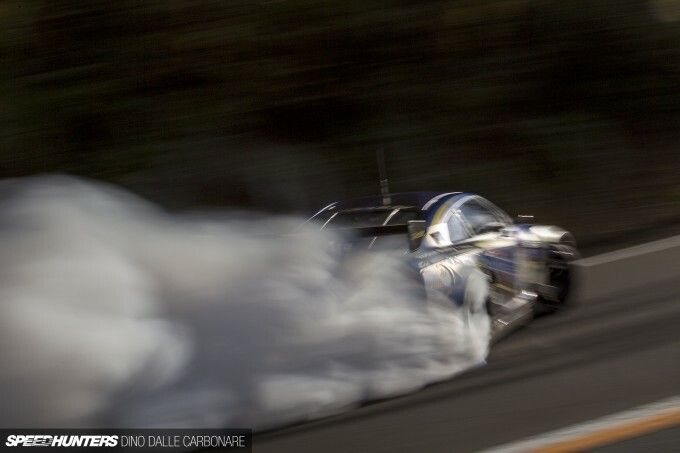 This is the stuff that defines the term "Speedhunters". 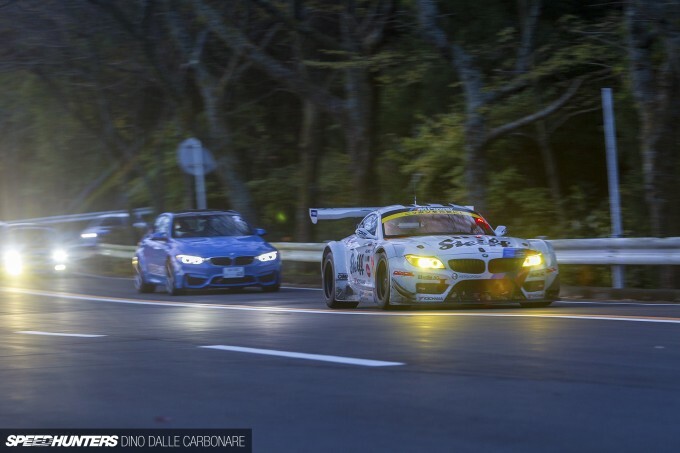 Dino can you make feature for Z4 GT3? Because "...this is a country that’s regulated to the hilt." There's a lot of politic$ involved with closing public roads to *cough* race cars. And then theres the logistics of a Euro-centric series getting its teams and fans there. I hope to see the event return with more crazier machines to run: Pagani Huayra, Honda HSV-10, Office-K Maserati and of course Kobayashi in a Caterham 620R!! vroomtothetomb majik16106 speedhunters_dino DecMcClure My issue wasn't really with Dino's response in direct toward turning it into an FIA event. I would agree on all those account. It was specifically this part of the response that my "because" was directed: "has to stay small-ish and stay Japan based when it comes to cars". I don't why this event shouldn't become much bigger, and why invites shouldn't be given to international teams to come over. I mean.. As a speedhunters related thing.. why not the LaSupra. I'd love to see that things tackle this. KRB audi? Something like that. That was my thinking. Don't keep it small. Make it big. These are the kinds of events that help inspire people to try other forms of motorsports. Ralliers, drifters, road racers.. all in one place. 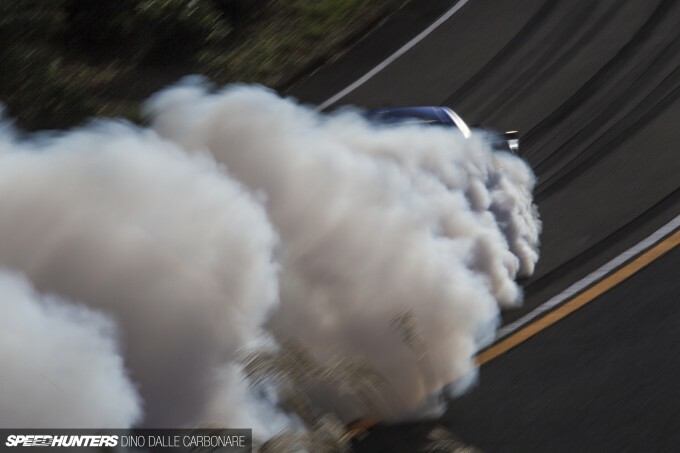 People who have less exposure to something like hillclimbs would come for the drifting or something like that, come for the coverage, and leave searching youtube for other hillclimbs. Just my thoughts. Dino, you forgot to tell us the maximum smile per hour that you got when covering this event... great article! Jagdroach Only a few beers? majik16106 Hmmm...howzabout a once-every-two-years event? 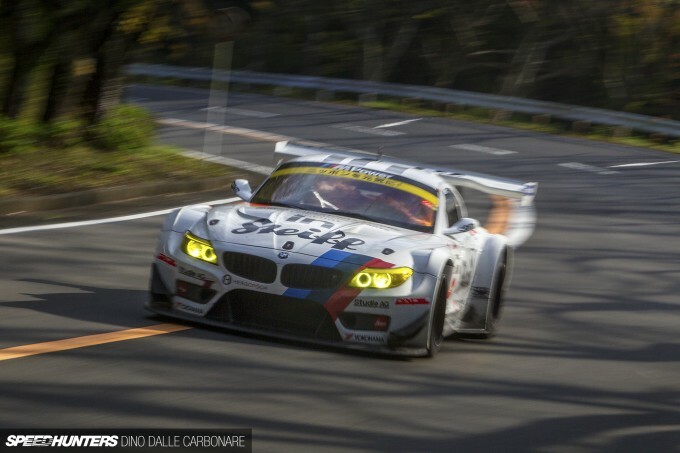 And somehow I wish the Z4 GT3 got a road version. Well, at least Aston will have a V12 one. Whoops. Are those spoilers I said? Surely you've known that somewhere. I'd rather see this hillclimb like this, almost secret and happens once every two or so years. It brings in the best and meanest of the best and meanest of the best and meanest for a different kind of test. It's got an easier, comfier ambience. It's not too pretentious. And, most especially, it's not too crowded, so those who stand out will stand out. I want more of this, but not as a yearly event. @Anymouse Shooting a car going 150 mph at 12 feet is not easy. Especially on a hill climb where you have only a few chances to get the car and not 400 laps to get the shot. I think they look pretty damn good. Panning a car at that speed is nothing like panning a drift car at 40 mph. I think the scenery and cars come across as good as anyone could portray it. Excellent article. I was really hoping to get the issue of Motorhead magazine focusing on this event, but I'm yet to receive a reply from the Motorhead E-mail address, so I'm glad you have produced this article! The road going BMW Z4 does absolutely nothing for me... but I can't stop looking at that GT version. I can't see an angle it doesn't look good from and it sounds phenomenal. 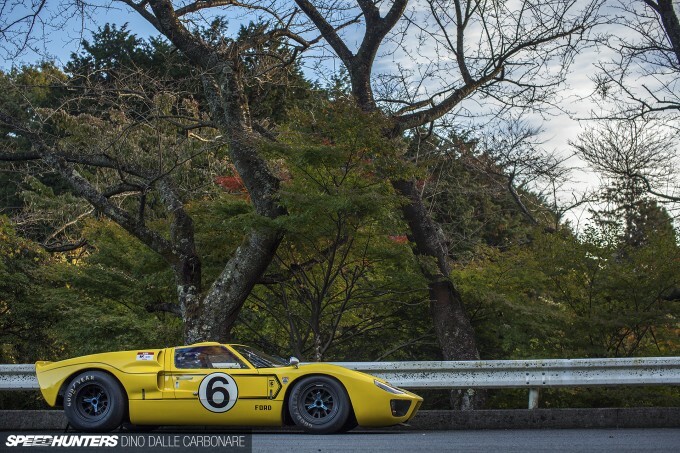 Oh, incidentally, further to your line on the GT40 Dino "it stood just a metre tall". Actually the GT40 stands slightly over a metre tall, 40 inches tall to be precise: that is where the "40" in the GT40 name comes from! hawi51 I'm sure he would have been pinging it off the limiter for the duration. For years I've been seeing the Gran Turismo banner across the windshields of some of the sickest drift/race cars but they're not in the game... I don't understand it..
tbtstt I'll get my measure out next time I see it. 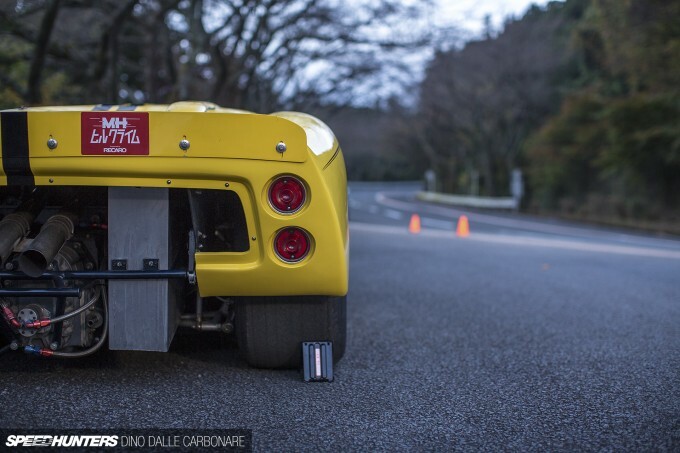 It's a Japanese GT40, it's obviously slammed on air-suspension! UWerqxTeam_MJ Last sentence. YES. YES. YES and YES again! Dhikaz I sure can! It's gonna happen! DjaranJones Kawabata doesn't get scared. wbrunner23 Thank a lot man! For me, this is when you're at your best, Dino. Awesome, awesome coverage. @Anymouse The banding and noise is pretty bad when you point it out. I wonder if it has anything to do with the 1D Dino is using, instead of the 5D he uses in other posts? speedhunters_dino To be fair, it was a passing comment, but I see your point. But the FIA doesn't always get it wrong. 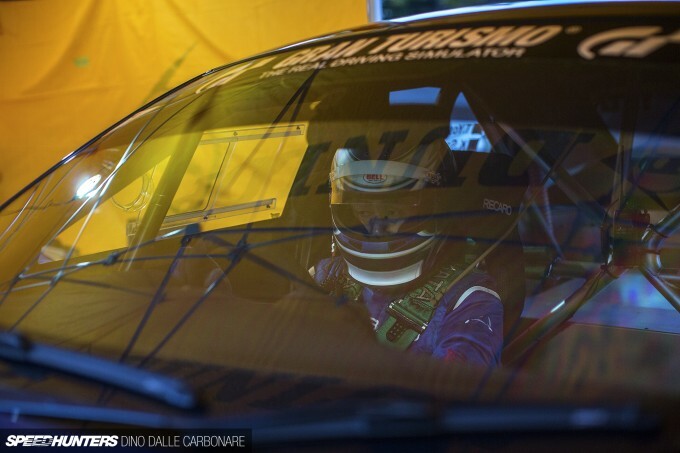 The European Hillclimb series is mega. From garage built hot hatches to fully fledged GP2 racers and just about everything in between. What's not to love?! 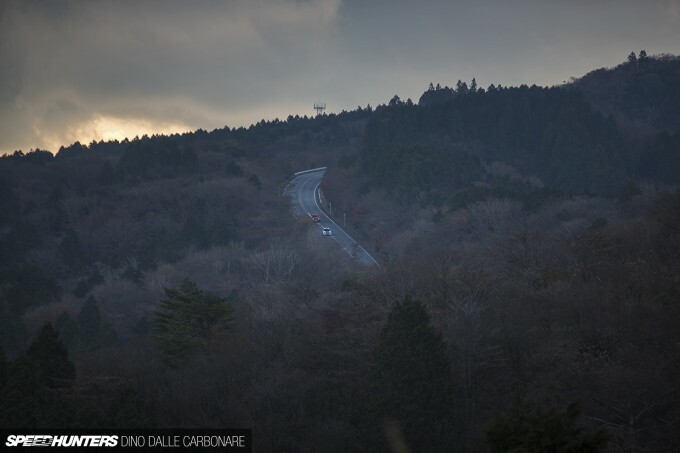 speedhunters_dino UWerqxTeam_MJ if this happens again, they need the real RE Amemiya Touge Monster to tackle the touge. i mean, what car is better built to take this on, initial D style? Don't get me wrong i LOVe seeing these race cars and the HKS car setting their time, but the monster....give it to Doriken!!!! @DWARRIORZ they sponsor the event series, but that doesn't mean the cars and sponsors on the cars are licensed to the game. 7 days into 2015 and we have a candidate for article of the year. Dino, please do what you can to make sure this happens again! Your article is better than the video to be honest. Disappointed in the footage that was shot, big time. Could've been so much more. Massive respect to them actually holding the event, though. Oh damn, thank you. Was looking forward to see the whole event on DVD or something along the line. Thank you. Thank you soo much Dino! I watched this video about 1-2 weeks ago and was instantly intrigued but wasn't given much info in the video. This article explained so much and those photos are damn beautiful! demzo_BRG I'd be happy with the Japanese version (even though I can't read it): I just can't get an answer out of anyone in Japan! D1RGE EXE Yes, that too. 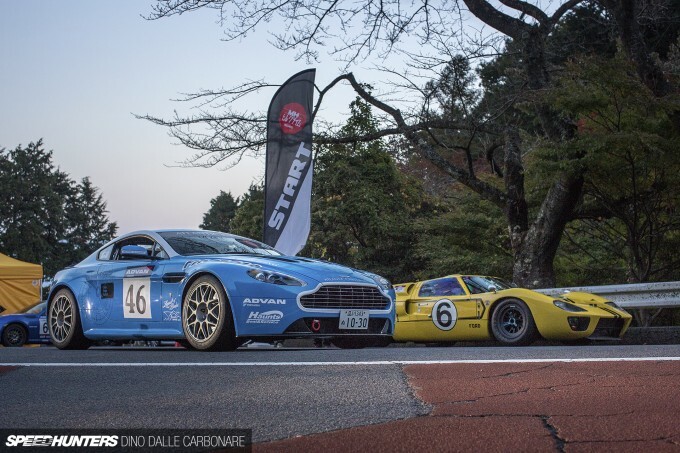 A bloke with a road-to-race-to-road car and the old venerable Touge Master in one road. Oh, the salivary glands that would need fixing. speedhunters_dino Will you shoot the SCG 003 when it drops? Please do so. That car can do what some feature cars here can't. 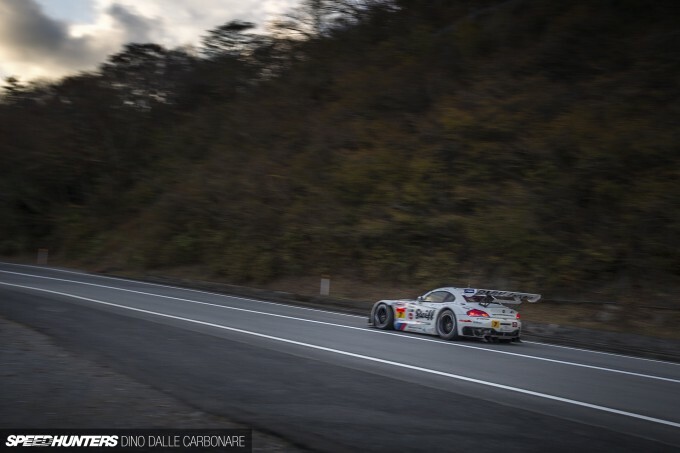 tbtstt "The road going BMW Z4 does absolutely nothing for me... but I can't stop looking at that GT version." 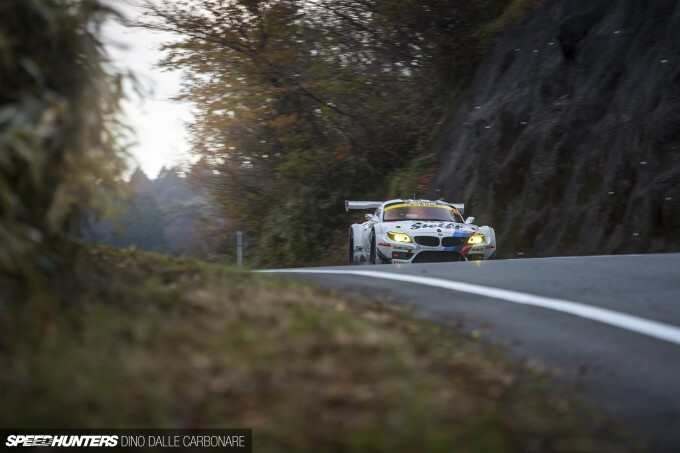 What you want is a road-going Z4 GT3. Like a Porsche 911 GT3. Only front-engined. But isn't BMW gonna use the Z4 platform to help Toyota make the Supra? econti Thanks! But better in what way? D1RGE EXE It has to happen again! Amazing post Dino! I think that Nobuteru Taniguchi will always be my hero Purley because he drove the CT230R! Such a radical event, can't wait for next year!!! Funnily enough I'm much the same when it comes to the 911: the vast majority of the 911 does nothing for me, but I would sell several vital organs to own a GT3 911! Awesome! 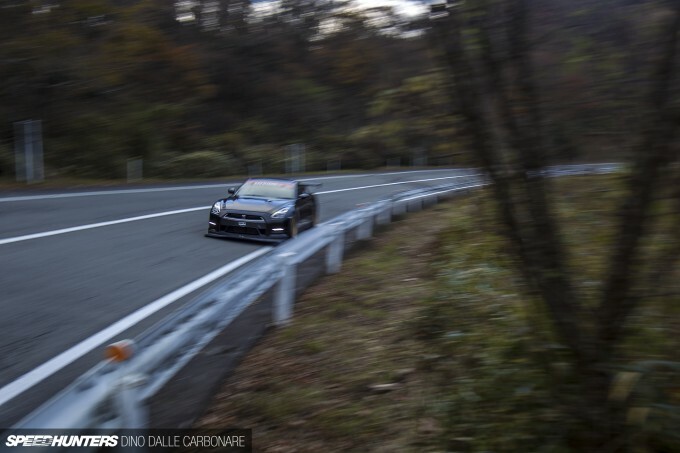 So, the Hakone Turnpike is a private road? How come? Who owns it? I thought that Japan is a country where space is at minimum. Somebody really owns a mountain? First the zero yon and now this. What an event. Thank you Motorhead. Anyway, Kawabata had done the reverse entry and that's awesome And now he's drifted a mountain bridge. He's my new hero too. Great post, Dino! The reason why I want to go to Japan is because of this. Aside from anime, this is one of my targets! greenroadster Everything is bought and paid for in Japan.